Jimmy Fallon, Jimmy Kimmel and James Corden are some of today’s most recognizable comedians — and that’s all thanks to their late-night talk shows. Late-night TV is a huge inspiration for many in UPTV, Pitt’s television club, and led to the creation of the University’s own late-night talk show — “Pitt Tonight” — currently hosted by junior communication major Andrew Dow. “Pitt Tonight” kicked off the 2018 school year on Sunday with the premiere of the show’s fourth season. The recording took place at the Charity Randall Theatre and featured a packed studio audience, an on-stage jazz band — the Allies of the Boulevard — and plenty of staff members clad in all black taking care of camera movement and furniture on stage. This massive production was essentially put together in one weekend after the staff returned to campus from summer break. Amongst the busy crew was staff writer and sophomore theatre arts major Alex Dolinger. The big boss of “Pitt Tonight” — executive producer Annabelle Hanflig — described the process of setting up this episode that started long before the full staff got together. Setting up the season four premiere took a few weeks, the senior communication and political science student said. It recorded on the eve of the first day of school, which was a difficult task. “I always knew holding the episode before the first day of classes would be a challenge, but I thought that it would be worth it,” she added. Hanflig plays a large role in the production of “Pitt Tonight,” but she does not act alone. She worked closely with the host of the show to plan out how this season premiere would happen. This hard work and planning paid off once the whole staff made it to campus. On the evening of the premiere, a line of students waited patiently at the door to the Charity Randall Theatre. The line stemmed all the way back to the stoplight at Schenley Drive Extension. This long line resulted in a full house, with Hanflig sitting at the front of the studio audience calling for applause when necessary and Dolinger sitting at the back of the crowd running the teleprompter. After a smooth prelude to the show from Allies of the Boulevard, Dow entered the stage amidst a boom of cheers and applause. Dow appeared extremely comfortable on stage, rolling jokes off his tongue with ease to incite roars of laughter. 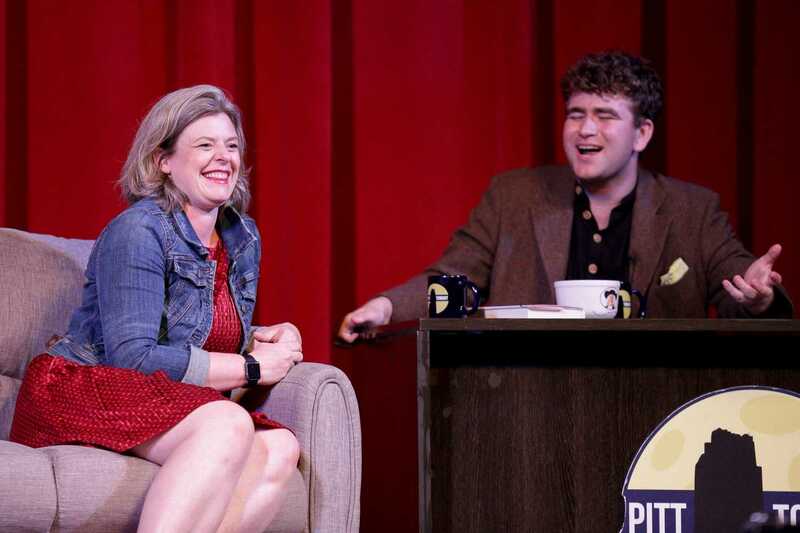 The show’s guests for the episode — local comedian Day Bracey and Pitt professor, author and former Disney Channel screenwriter Siobhan Vivian — chatted with Dow and enjoyed his comedic spirit just as much as the audience did. After the entertaining interviews with the guests, the night was not yet complete. A musical performance was necessary to make this taping of “Pitt Tonight” a true late-night episode. Local band the Lone Pines — an indie folk-rock trio — took the stage to finish out the night. After the upbeat performance, Dow and all the guests of the evening came back out onto the stage for a bow. For Dow, the season premiere was a new experience, despite this being his second year with the show after succeeding Jesse Irwin. Dow was pleased with his performance, and it seemed as though many in the audience were as well. After the show, Dow left the stage to numerous congratulatory hugs, one of the biggest ones coming from Hanflig, who was equally pleased with how the evening went. Though the taping of the premiere was a hit, it will be a few more weeks before the episode hits YouTube, where all of the “Pitt Tonight” episodes are posted. Hanflig stated that the editing and posting processes tend to take about two to three weeks. In the meantime, she and the rest of the “Pitt Tonight” staff can reflect on this successful kickoff to the school year. “We’d been thinking about the premiere all summer, and to see it go off as well as it did was incredible,” Hanflig said.